How to calculate the electromotive force? This Faraday's law calculator will help you find the electromotive force induced in a closed circuit. If you attached a metal wire to a battery, you would create a current - electrons would move along the wire. Then, if you put this wire in a magnetic field, an additional electric force would be induced by the motion of electrons in the field. This effect also works in reverse - when stationary electrons are placed in a varying magnetic field, an electromotive force (EMF) is induced, and the current starts to flow. This phenomenon is known as electromagnetic induction. The magnetic field has two main characteristics. The first one is the magnitude B of the field and is measured in teslas (symbol T), or newtons per meter per ampere. The second - magnetic flux Φ - is defined as the magnetic field passing through a surface, and is measured in webers (symbol Wb). Magnitude and flux are interdependent - you can use the equation below to easily switch between them. A stands for the cross-sectional area of the coil, in which the EMF is induced. This is the formula used by our Faraday's law calculator. Usually, you won't immediately know what is the magnetic flux in the coil. Don't worry, though - our electromagnetic induction calculator can find it, too! Just follow the steps below to calculate the induced voltage. Decide on the cross-sectional area and the number of turns in the loop. For example, you can use a circular coil with a cross-section of 30 cm² and with ten turns. Find out what is the magnitude of the magnetic field. For instance, we can assume a field of 0.4 teslas. Now, determine how long does it take the magnetic field to change by 0.4 T. We can assume that it took 8 seconds. The induced voltage is equal to 0.0015 V. The minus sign indicates that the direction of the current opposes the direction of the magnetic flux. If you liked this Faraday's law calculator, make sure to check out the Ohm's law calculator, too! 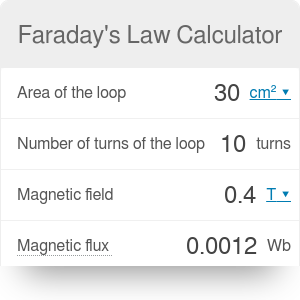 Faraday's Law Calculator can be embedded on your website to enrich the content you wrote and make it easier for your visitors to understand your message.